Solid wood floors can last over 100 years. And high traffic areas can be revitalized to keep your floor looking timelessly fresh. Wood floors are hypoallergenic and easy to clean, making bare feet feel right at home. Thanks to the incredible variety of wood species, plank widths, lengths, colors, textures and finishes…you’ll easily customize your wood floor to match your individual style. 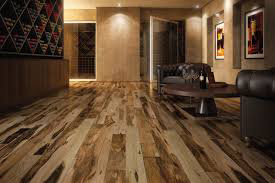 Even after wood’s been cut for hundreds of years, it still reacts to temperature and humidity fluctuations. Engineered hardwood overcomes this by providing a mix of real wood beauty on top, supported by a sturdy substrate below. This makes engineered wood a smart choice for moist environments such as bathrooms, and high humidity areas, as it doesn’t fluctuate, expand, or contract as much as solid hardwood. And because the layer on top is real wood, engineered wood flooring comes in incredible varieties and finishes to perfectly match your design aesthetic. Prefinished floors mean the messy dusting, sanding, and finishing are all done at the factory. This convenience speeds up installations and lets you walk on the floor instantly. Prefinished includes both engineered and solid hardwood. You choose the color, texture, species, plank width and length to create your ideal look. Unfinished floors are installed by a licensed contractor who crafts each plank into place. The floor is then finished by sanding, staining (if preferred), and sealing. Options range from common chemical-based sealants to natural oils. We can help recommend the ideal sealant based on the wood, your personal preferences, and the floor’s expected traffic flow. For the ultimate personalization, we provide most species of wood in any texture, color and size. This includes the rarer 12 foot length planks. Your wood can be dyed to match almost any color to compliment furniture and other design elements perfectly. All while maintaining the individual characteristics of the wood for a signature style. Unlike new wood that’s hand distressed to look old, reclaimed/antique wood is truly historical. It’s a one-of-a-kind wood with characteristic knots and natural blemishes. And reclaimed wood is truly sustainable as it doesn’t require harvesting from new trees. The wood often comes from demolished buildings and barns, salvaged from extremely old timbers, or rescued from lakes and rivers after the trees were originally harvested back in the 1800s but sank while traveling to the mill. The wood comes unfinished with an impressive array of color and finishing options. Each plank tells such a beautiful story, we dedicated an entire room to showcase its beauty and your many options. Acrylic-infused woods are finished planks permeated with liquid acrylic. This makes the planks up to 300% more dent resistant than standard wood flooring. It’s ideal for busy households or commercial properties who appreciate high style. The finished planks are VOC and formaldehyde free. It’s so durable, your floors are backed by a 50-year finish/structural lifetime warranty.